Beth and I stopped for one night on our way to Yuma...not long enough to tour the park, but long enough to get a small sampling until next time. 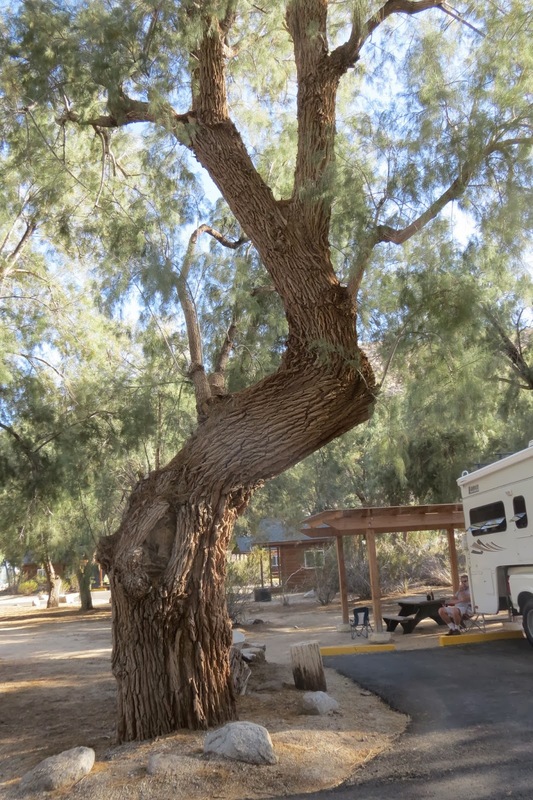 We stayed in Tamarisk Grove Campground just off Rte 78. The big Tamarisk trees are not native (actually from the Middle East). They were planted here in the 1930s when the campground was a prison camp for San Diego County inmates. They make nice shade, but drink up too much water. We hiked two trails from the campground. The first is called Cactus Loop Trail, a short but steep and rocky loop trail, highlighting desert plants. They called this chuparosa the "hummingbird bush," but today it's a "hummingbee bush." This shrub with the tiny leaves is called a catclaw shrub. Can you see why? 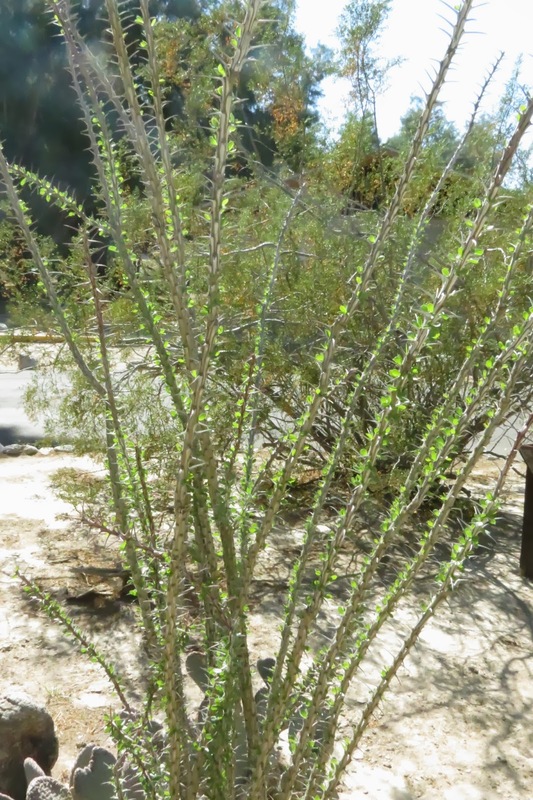 The ocotillo is not a cactus, but still has sharp thorns. In springtime the stems are tipped with bright red blossoms. It's springtime here. Costa's Hummingbird perched in the ocotillo. The Beavertail Cactus pads contain bunches of tiny spines, so tiny you can't use tweezers to remove them...sticky tape might help. The Barrel Cactus is beginning to bloom. Going up the rocky trail. Looking back at the Tamarisk Grove that is our campground. Looking for Desert Bighorn Sheep. They were seen from this trail yesterday. "Painted" rocks...a rust colored stain that appears after thousands of years of exposure to the desert. Could be caused by microscopic bacteria that absorb manganese and iron oxide. A cluster of "hedgehog cactus," also called "calico cactus" because of its multi-colored spines. They grow to about a foot high. On the right is cholla cactus, also known as the "teddy bear." I don't think I'd call this cactus a teddy bear...not cuddly at all. Looking for the sheep down in the wash...no sheep. Do you see the tiny cactus growing out of the split rock? Ocotillo produce delicate green leaves after a rain, but they are short lived. I believe this one is watered in the campground...it's the only one I saw with leaves. The second trail leads to an historic desert watering hole, Yaqui Well. It is a naturally occurring spring that has supported centuries of Kumeyaay people, pioneers and ranchers, as well as plants and wildlife. When hiking with Beth, always ask her where she has secured her RV key...or you might end up hiking the trail twice! Desert Mistletoe grows in clumps in bushes and trees, and its berries attract birds. I was first introduced to the Phainopepla in Baja. This gray one is a female. We've come to the well...and found it dry. Disappointing. But still there are birds around. A sign about the Yaqui Well. The sun was going down, so we followed the dirt road back to the campground. Plants are beginning to bloom in the desert. A couple more pictures of the Tamarisk Trees with their interesting bark and shapes. They are a type of cedar. Now we are in Arizona, and will spend a few days near Yuma.